I wanted to do a quick little bonus post today. This is week two of Online Card Classes Summer Card Camp 2 and I just couldn't wait make a card based on this week's inspiration. Again this week we have a fun color combo and three sketches to follow. This is my take on the one of the sketches using the colors of the week. I opened my scraps drawer and grabbed some patterned papers and cut them into circles. Two of the circles are actually stamped on the paper. They are the brown records from a new set from Reverse Confetti called Inner Rocker Star. I heat embossed my sentiment and arrow using Coffee Archival ink. 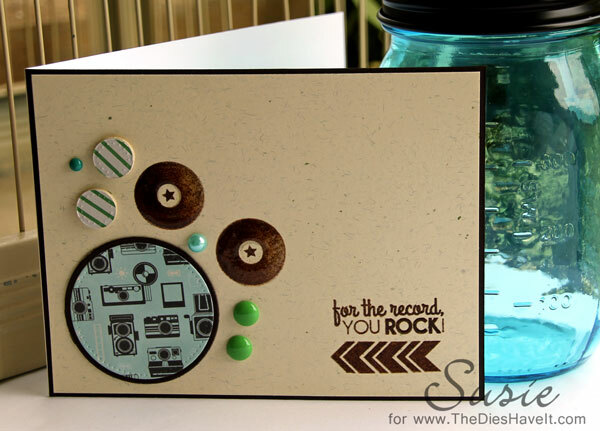 The sentiment is from the Inner Rock Star set and the arrow is from the Reverse Confetti Arrows 'n Elements set. To finish my card I mounted it on brown card stock and added a few enamel dots. This was a fun and easy card! I am off to post it over at the Reverse Confetti Blog and the Online Card Class site too. Great job on the sketch! Love your card and design! So fresh! This is adorable!! I LOVE that sentiment!! Great job on the technique!! this is cool! love the records and circles you used and the fun arrow to accent the sentiment.